Last edited by Stanley on 21 Jun 2004 09:39 pm, edited 2 times in total. I am doing an impossible task of making a Banana pancake, trying to put the small yellow pieces that were coming from the fuse. The impact force was so severe that the fuse together with the nose cone are broken into halves. 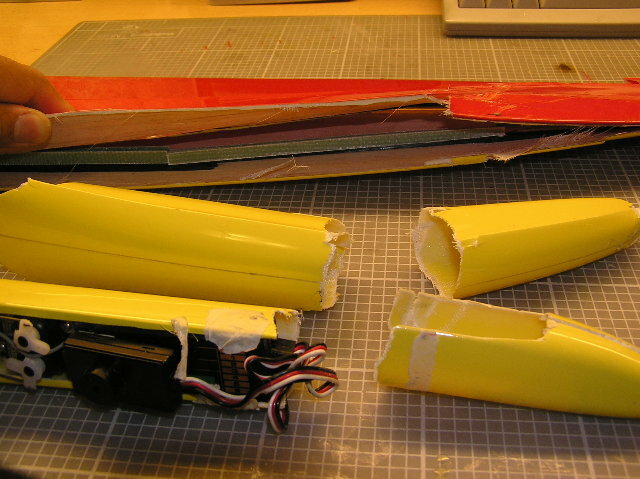 The wing is separated into the upper and lower parts, the lower part is impossible to fix as it can fold like a paper. So the Banana will have to be in a deep comma for years until I've leant the skill from surgery masters like Y.C. Last edited by Stanley on 21 Jun 2004 09:39 pm, edited 1 time in total. Don't be so upset about your broken small banana, I tell you something, there is nothing impossible in the world, soon or later, death will become alive!!!!!!!! If you really love the banana, you may order another one....If you really love that broken one, I would like to try to put them back for u free! P.S. It will be better to upload some pictures about how does it look like now! Cool down please ! Personally, I think no one should be blamed in this matter. There's problem with the existing practice to report band. To prevent the same incident from happenning again, we do need some guidance / rule on it. 1. If there is a band form, please write your band down, AND shout it out. 2. If there is NO band form, just shout your band out. If band form is available at later time, please write it down. 嘩係喎，究竟係點撞至會撞成咁? 似係被人刑毀多 D . ..